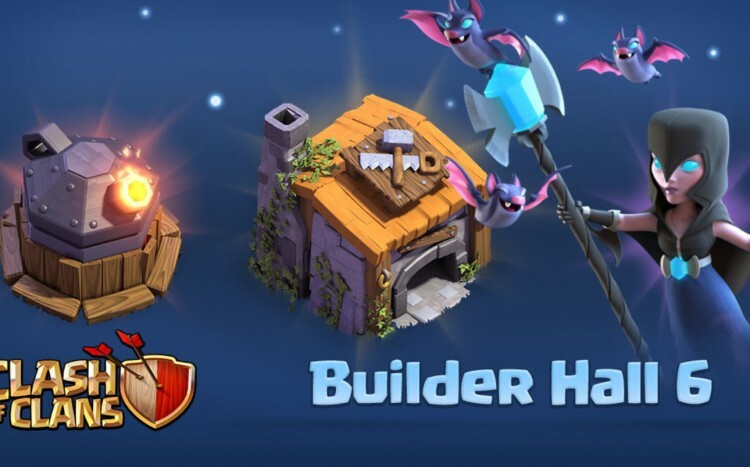 Clash of Clans Builder Hall 6 update is coming with lot of new features, Clashers who have completed all their level to Builder Hall 6 can get into the new town hall and unlock plenty of new features, Designed for this Builder Hall, To know what features are going to be added read this article till the end. Look at the above video from Supercell officials, It will get you an idea. You will get an archer tower. You will get one crusher. You will get one mine. You will get one Megamine. You will get +4 Walls. You will get one Army Camp. Unlocks level 12 for all troops when you upgrade Star lab to level 6. New troop such as Night Witch which is same as Clash Royale going to be added in Clash of Clans. Night Witch will spawn Bats, Which will attack enemy. Night Witch attack with a spear and spawns bats periodically. New Building Roaster which roasts the enemies from Land and Sky Both. Roaster is mainly designed to kill Night Witch. These are some of the features which are going to be added in the new update, If you want to download the Mod Apk and Apk for Clash of Clans, As soon as it gets launched, Then do subscribe to Clash of Duty, Press the bell icon at top corner, You will recieve updates as soon as it gets released directly to your inbox or as a push notification in your mobile. We hope you have enjoyed the article on Clash of Clans Builder Hall 6.